Gold Coast (Australia) (AFP) - A bullish India celebrated their best boxing performance at a Commonwealth Games and are now targeting more success to rival the best nations at the Tokyo 2020 Olympics. Top figures in Indian boxing said their exploits on Australia's Gold Coast were no fluke, even if they surpassed their own expectations in racking up nine medals in the sport. 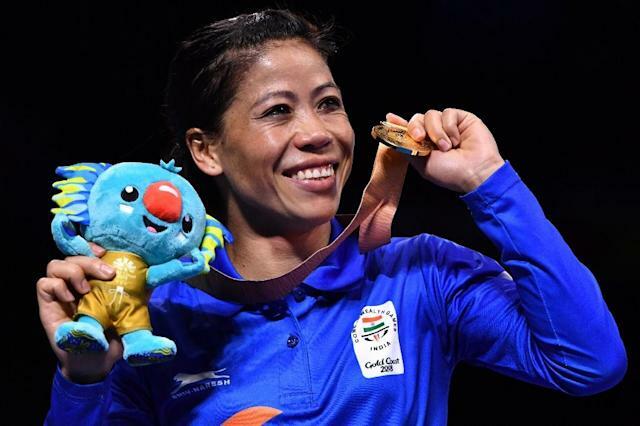 India pipped hosts Australia to sit second in the boxing medals table with three golds -- Mary Kom (light-flyweight), Vikas Krishan (middleweight) and Gaurav Solanki (flyweight). England, who have poured significant resources into amateur boxing, topped the table with six gold medals. It was a highly satisfactory ending to a fortnight that started badly for Indian boxing with a warning for breaking the Games' strict no needle policy after giving a vitamin injection to an unnamed fighter. All this comes just a few years after Indian boxing reached a nadir when its federation was effectively expelled by the sport's amateur world governing body, the International Boxing Association (AIBA), over how it elected its officials. Now back in the international fold as the Boxing Federation of India (BFI), its president Ajay Singh told AFP at the Gold Coast: "Last year a new federation took over and we are trying to ensure that we hold championships in India and have our boxers participate in all international championships. "We make sure we train our boxers well, make sure we plan their fights well and there's a great deal of enthusiasm for boxing in India." Singh, who has been in the post for 19 months, added boldly: "We expect that in the next two years India will be one of the leading boxing nations in the world." So far, so good. At the Glasgow 2014 Commonwealths, India failed to win one gold, underlining the stark improvement since. "We have tried to put a lot of focus on the boxers themselves, leave out the politics and make sure that we have the best support staff training our boxers," said Singh. "Also make sure that our boxers get as much exposure as possible -- Indian fighters were not going out fighting anywhere in the world." He is changing that, sending Indian boxers abroad for tournaments and hosting international events such as January's inaugural Indian Open. "We are also trying to plan scientifically -- how they train for endurance, what food they eat, scientifically how they can upgrade their skills," Singh said. "I don't think that before we looked at boxing as a sport in which India needed to be a world power." Santiago Nieva was brought in just over a year ago as high-performance director and said that with a population of 1.3 billion people, there is no end of potential in India. The government and boxing federation provided good support, including financially, said the Argentine, who was previously in the same senior post in Swedish boxing. Boxers have described how Nieva will have an analyst make a video nasty of their mistakes, then send it to their phones so they can watch it any time, and hopefully avoid the same error in future. While striking an upbeat tone, Nieva said more work remained. After all, the Commonwealths are nowhere near as competitive as the Olympics. "If we compare ourselves to the top nations, we are not there yet," he cautioned, referencing Britain and Cuba. "We have a good infrastructure, but not compared to the best in the world," he added, mentioning sports technology and science. "When we get that -- it will take one or two years -- we will produce a lot of results."